And here she is! The beautiful, charming, and breathtakingly stunning daughter of God – Emily Harris – ready to graduate and step out into that mysterious world of post-college. 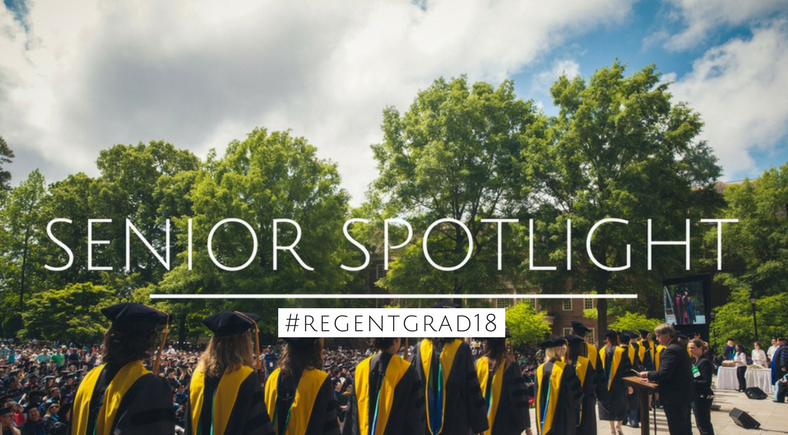 Serving others is her delight and loving is her talent, making her one of the most exemplary of students claiming the title of Regent graduate. An English major, Emily not only formed her own concentration in Cross-Cultural Communication, but she also helped found the first English Honor’s Society at Regent, traveled abroad to London and Paris, and served as a Life Group Leader. Emily on the study abroad trip to Paris, France, Jun. 2016. Lastly, I asked Emily what she would tell her freshman self. Her emphatic response, “Chill out!” sent us both into laughter. “It’s not all about you. Your worth is not in your grades. People are more important than projects. Taking care of your relationship with the Lord is more important than school.” A beautiful answer from a beautiful woman of God. I have so loved getting to know Emily Harris personally and am honored to call her one of my dear sisters in Christ and a wonderful friend. Thank you, Emily, on behalf of all of us here at Regent, for lifting our spirits when we were down and shining bright upon us the warmth of our Savior. May the Lord keep you as you embark upon your new adventures! Emily Boulter is a staff writer for The Daily Runner. Tell us your Regent squirrel story! September 26, 2013 Josh Fisher Comments Off on Tell us your Regent squirrel story!